Mexico–United States barrier at the border of Tijuana, Mexico and San Diego, USA. The crosses represent migrants who died in the crossing attempt. Some identified, some not. Surveillance tower in the background. 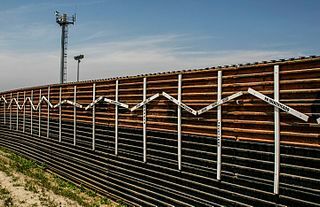 Michael Mulvaney, President Trump’s acting chief of staff, and other top White House officials are devising a plan to garner enough money to build Trump’s wall along the Mexican border. The plan will not need the administration to invoke a declaration of a national emergency. The plan involves the redirection of surplus federal dollars using an executive order. The funds can be moved from a variety of budgetary accounts without the need for the congress to sign off. Trump will no longer need to persuade Democrats to give him the $5.7 billion he is demanding and will also alleviate the need to declare a state of national emergency. Budget officials are considering moving funds from two Army Corps of Engineers’ flood control projects in California, plus disaster relief monies earmarked for Puerto Rico and California. Funds might also be diverted from the Department of Defense which was originally intended for, but not yet used for various construction projects like family housing or military base infrastructure. The solution is not without its own problems. Re-designating money via executive order may be permitted technically, but it will certainly be challenged in court. Several powerful members of Congress will argue that the president is coming a bit too close to stepping on the toes of the legislature’s constitutional powers to appropriate funds. Some Trump officials think this route to the wall might even be more susceptible to a court challenge than calling a national emergency. The top Republican on the House Armed Services Committee stated that siphoning money away from military construction would harm the potential readiness of the armed forces.